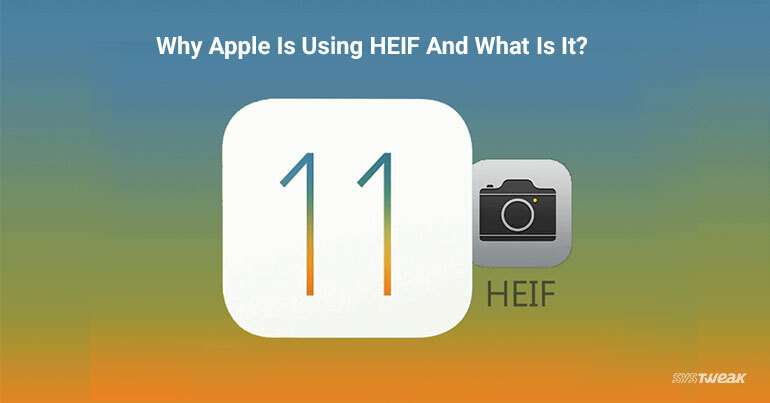 Why Apple is Using HEIF and What is it? Apple which is known for bringing innovation in its products adopted a new format for images called HEIF (High Efficiency Image Format) in 2017. The images in this format takes less storage and are of higher quality. Must Read: A Ride Through 10 Years of Apple’s iPhone Evolution: Then and Now! Before HEIF, Apple used a file format called JPEG like other devices. This format was developed in 1992, and ruled the world of photography and imaging for a long time but now computers are more capable to do some operations quickly so apple has experimented with this new file format. Advanced video compression technology developed by the Motion Picture Experts Group, HVEC (also known as H.265) is the underlying technology of HEIF. That’s why it is capable of carrying so much information. On the camera in the iPhone 7 you can see the application of HEIF which can capture 10-bit color information, but the JPEG format can only capture color in 8-bit. That means the HEIF format supports transparency and can handle images in 16-bit. HEIF image is around 50 percent smaller than the same image saved in JPEG format. That means because of HEIF you will have 50% extra storage for your images which is good news for iPhone users. Another add on advantage is that HEIF can carry lots of different kinds of information such as location time date of the image. (EXIF Data). Where JPEG can carry the data that comprises a single image, HEIF acts like a container. You can store multiple images, and can also place audio, image thumbnails, depth of field information and other information in there. Users installing iOS 11 and macOS High Sierra will automatically be moved to the new image format, but remember your old images will not be converted to the new format automatically. Only the images captured after the upgrade will be kept in this new format. When you will share the images, Apple’s devices will simply convert HEIF pictures into JPEGs. You will not be able to notice the change. This is because Apple has provided HVEC video standard inside iPhone and iPad hardware from a long time. iPhones and iPads can encode and decode images in the video format very quickly and it is the same thing when handling HEIF. Now whenever you email an image or send it with an iMessage, or just work on it in an app which doesn’t possess HEIF support your device will quietly convert HEIF to JPEG in real-time. So, we can say that HEIF is the future format for images. In future, you will find some other devices compatible to this format and then it will save lots of space and deliver high quality images. Syncing Clipboards Between Mac and Windows Just Got Easier!